The Source Wall is broken. It’s scary to think about isn’t it? It’s not often when reading superhero comics that I find myself unnerved, but with this new era of Justice League I find myself feeling every more terrified as Synder inches further along in this grand epic of his. Yes Synder is writing big time superhero comics, but his horror roots are very present. Proving once again that cosmic horror is the creepiest kinda horror. As always this review will contain spoilers, so remember to read your comic before reading this review. You have been warned. 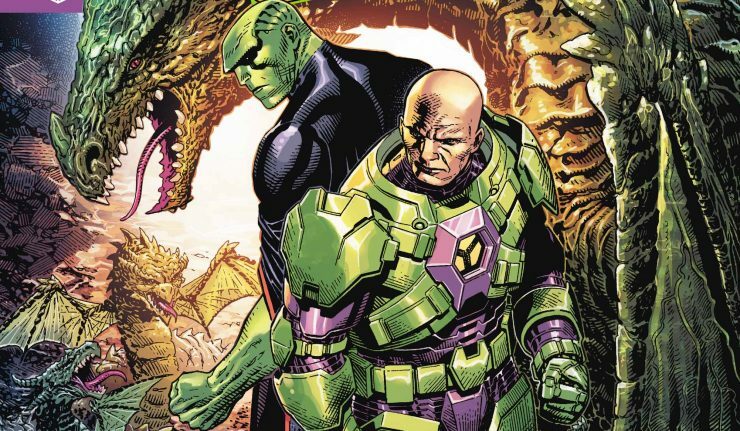 Martian Manhunter and Lex Luthor, two characters who I would not think to put together but Justice League #17 pairs them up in a way than I didn’t expect. Before I get into that, one thing I’ve began to appreciate over the course of this new volume of Justice League is the refocus on J’onn as the heart of the League. Something that’s been said so many times and ultimately it was proven to be lip service as J’onn would take a backseat to the Trinity or even Flash and Green Lantern. By having J’onn share this issue with Luthor, it’s cements his status as that figure head. Other writers would simply put Superman in this slot and it’ll be a diatribe between Luthor and Superman that we’ve seen over and over again. Despite that, there’s one thing about this issue that I wasn’t fond of. If you’re a veteran comic reader, chances are you know about Lex Luthor’s origin or one his origins (gotta love comics), but this issue turns Luthor’s past on it’s head to a degree. In short, Synder reveals that Lex was actually friends with J’onn when he was a young boy (oh and J’onn was captured as a child and taken to Earth). This leads to J’onn telling Luthor that he’s doesn’t have to side with Doom and he and Lex could stop Perpetua. I know that Synder has a grand plan, but this is the first decision that I don’t agree with. It feels unnecessary to give Luthor any kind of empathy, he’s at his best when he’s gone full psycho due to his arrogance. If the idea is to have Lex seemingly turn good then ultimately stab J’onn in the back, I as reader won’t fall for it, because it’s Lex Luthor and betraying people is what he does. Just look at the Joker from a few issues ago. What is amazing however is Jim Cheung’s pencils. This issue is a testament to Chueng’s storytelling. You can feel the intensity come off page as Luthor and J’onn stare each other down, dialog can only convey so much, you need the art to solidify those emotions and Cheung does that to perfection. The only detractor to this issue was the amount of inkers (three to be exact) and the overall quality of the line work does suffer a tad, but thankfully the storytelling remains solid. I wish Cheung was able to do more than a single issue, but I’ll gladly take what I can get.